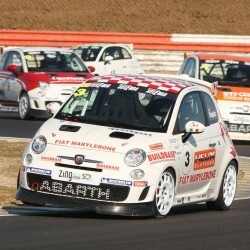 Speedsport driver Stefan Hodgetts had a stunning debut in the Trofeo Fiat Abarth 500 championship at Silverstone. The tin top ace has a deal to race for Mardi Gras in the newly formed championship. Backed by Buildbase and Fiat Marylebone. Testing went well and despite this being his first ever time in the car Stefan unoficially lapped the circuit over a second clear of his rivals on old tyres. Qualifying, however, didn't go quite as well, having missed the opening round at Oulton Park Stefan had never driven the car on new tyres before. It soon became apparent that the set up of the car needed to be changed for new tyres and Stefan's car didn't have the correct handling balance. Despite this Stefan managed to Qualify 2nd, less than a tenth off pole. For race 1 the team altered the car for the new level of grip and Stefan was able to take the lead and drive to a comfortable victory. This in itself was a great drive, however, it was even more impressive than it sounds. This is because during the warm up lap, Stefan was weaving to generate heat in his tyres when the car suddenly snapped to oversteer. Stef caught the slide but such was the violence of the oversteer that he dislocated his shoulder in doing so. Stefan being the tough racer he is simply popped his shoulder back into place himself on the grid and drove to victory in quite a lot of pain!!! Stef looked set to repeat his race 1 success in race 2 when a mechanical faliure ruled him out of the race.